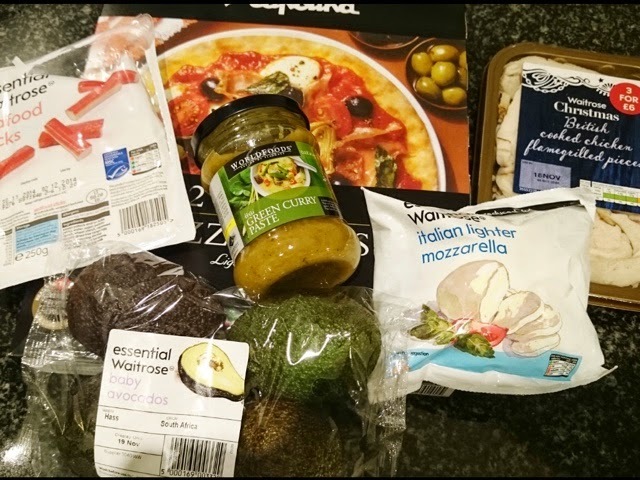 I recently took part in a WorldFoods penpal style challenge with the Laura (My Life In The Sun) in Canada where we got to pick items from the WorldFoods range and give each other a recipe to make. Click over to Laura's blog to see what recipe I gave her! Laura came up with an idea I wasn't sure about but I was up for trying! 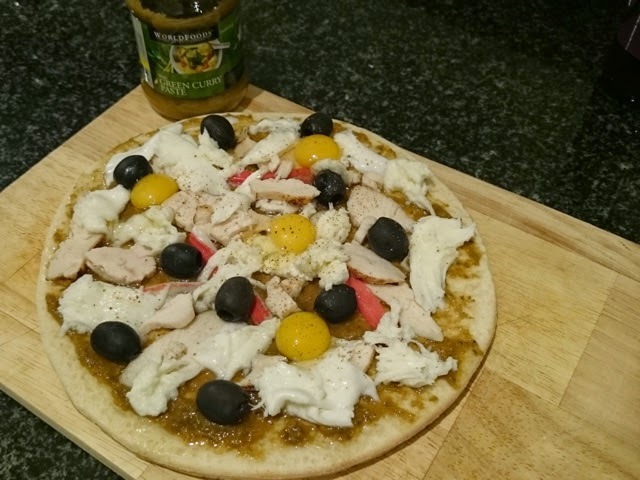 Her recipe for me was to create a pizza using the green curry paste instead of using the usual tomato puree. It actually tasted VERY good - thanks Laura! I did cheat a little in that I completely forgot to buy some of the pizza toppings she listed so I had to make do with what I had in my fridge, the ingredients below have been tweaked slightly. I didn't use the avocado in the end since it was not ripe enough. Prepare your favourite homemade pizza dough or purchase flatbread or pre-cooked pizza dough/naan. Pre-heat oven to 450 degrees F. Place dough on baking sheet or stone. Brush top of dough with olive oil. 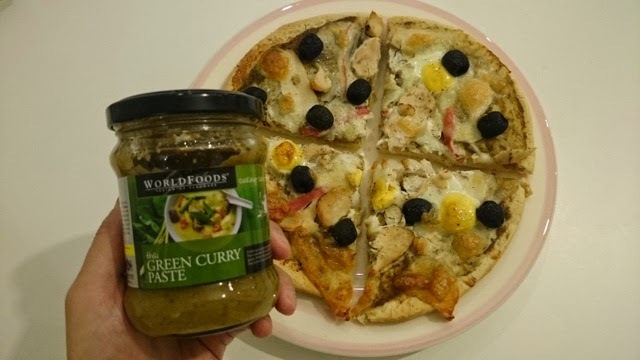 Mix yoghurt with green curry paste and spread on the pizza dough. Spread the chicken, pepper, and broccoli on top of the pizza dough and then top with as much grated cheese as desired. 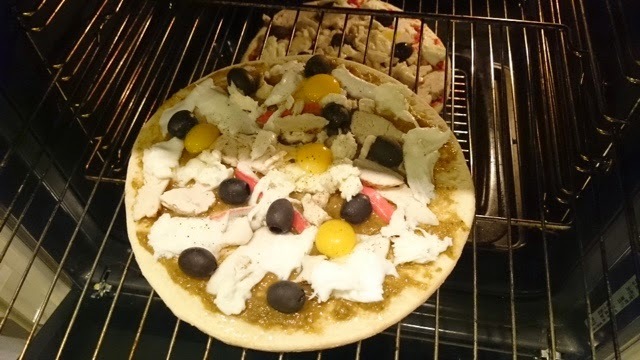 Place pizza in oven and bake until crust is brown and cheese is melted. 10-15 minutes. 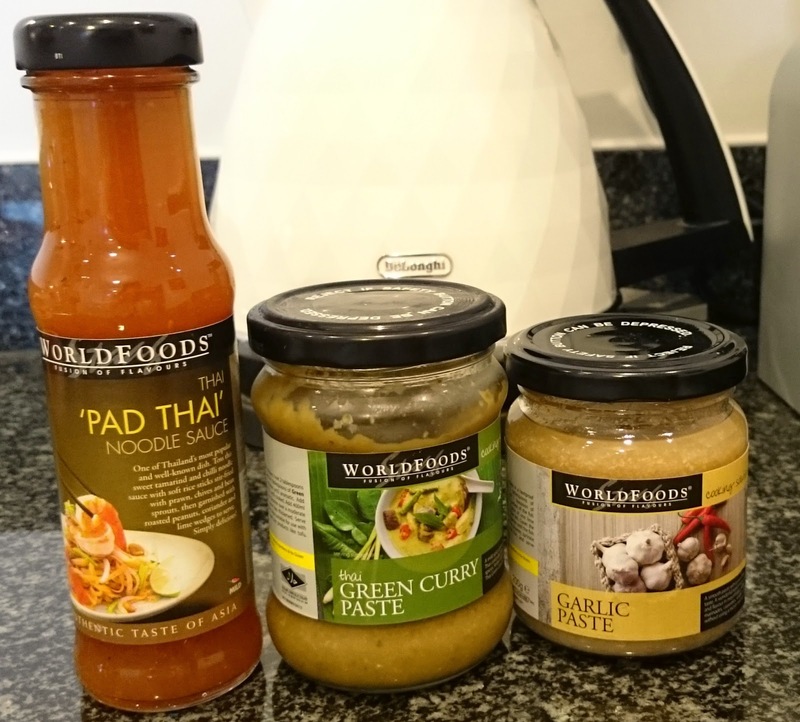 Along with he green curry paste I also picked a PadThai noodle sauce and garlic paste. I look forward to trying out the Pad Thai sauce for when I have friends over for dinner since that is super easy to make! As for the garlic paste it goes with a lot of Asian cooking so it will come in handy! you are making me hungry, girl! lol. looks good. love thai food! Hehe...I was surprised by how tasty it was and the sauce is delicious! You can pick this brand up in the US so try it! Thanks - will be stopping by! Mmm looks delicious. Thanks for sharing! It's a random combo but it seems to work! Thanks for stopping by! I love Thai but to be honest - that sounds a bit odd to me. I thought the same but since it's a challenge I went along with it. Very surprised it tasted so good! ah fab idea with pesto, think we will be doing more home made pizzas next year and experiment! Thanks for stopping by Lucy!